September 15th is International Dot Day! International Dot Day is a day to celebrate being creative! and create some dot creations of our own! Enjoy the slide show of our Dot Day celebration of creativity! What did you enjoy most about International Dot Day? How will you celebrate at home? Can you think of anything else to create with a dot? It looks like you guys had an amazing time adding a new element to dots today! I don't remember celebrating Dot Day with you when I was in third grade. 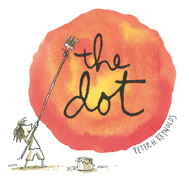 Tomorrow, I am going to celebrate Dot Day by wearing polka dots! I am also going to try to encourage my whole family into wearing polka dots, too! Has International Dot Day been around for a long time, or is it a new celebration? How nice to get a comment from a former student! I love it! This is the first year that I celebrated International Dot Day, and I loved it! The book was published in 2004, so it was celebrated sometime after that. Do you have any ideas of how we can celebrate next year? Dot Day was very fun! I liked drawing the dots outside with dots. For Dot Day, I am going to celebrate by drawing all kinds of dots on paper. It was also really fun drawing dots on our desks. How are you going to celebrate International Dot Day? What fascinated me was the map on the site. It had its basic map yet scattered across it were dots representing those taking part in International Dot Day. It made me think, can a dot be more than just a dot? If we look at maps on our blogs, we have to realise, the dots represent people, classes, schools and communities. They link people around the world and so represent the connections we have with so many others. Once I knew what the goals of International Dot Day were, I was prepared to see how your class had released the creativity we all have inside us. I wasn’t disappointed. I found the patterns complex, colourful and, I believe, containing meaning to each creator. With so many created in chalk, I then thought of how temporary the patterns were. Rain or a hosing of the path would lose them forever yet they have now been shared with the world. What a wonderful experience for you all on International Dot Day. Your dot creativity linked you with others around the world. I can only imagine the conversations happening throughout the day for creativity is not only in the patterns, it’s in the thoughts we have while taking part and the words we share along the way. Inspired by the creativity Phoenix School, your class and a New Zealand class's posts on International Dot Day, I felt inspired to look at dots in different ways. In answer to a question from Phoenix school, I added a post to my "Extended Comments for Students" blog, including a link to this post. N.B. the link in my previous comment was for a New Zealand teacher not U.K. I was delighted to find your video on your blog today. I particularly loved how you made your dots on your desk. At first I thought you meant you had a piece of paper and worked on your desk. I should have known better. Mrs. Yollis is much more creative than that. My school also celebrated International Dot Day this week. We too had a marvelous time. I was amazed at the variety of dots that they created, using all different kinds of materials. Each dot has a story to tell so we are creating a voicethread so that we can each share our thoughts with others. We ran out of time, but will finish it on Monday. Then we can share it with you. We'd love to have you follow our brand-new blog: http://kidblog.org/PhoenixSchool/ It's the first one we have had so we are very excited about having a place to exchange ideas and thoughts with others around the world. I really enjoyed reading about your wonderful day been Dot Day. What a great way to get creative. Your art work was awesome. I remember back at school we did a similar thing in our art classes. It had nothing to do with celebrating International Dot Day. It was more to do with just getting creative with different shapes to create a picture. I really enjoyed your creations with the dot and think you did a wonderful job. Mrs. Yollis is always great at thinking up new ways to have fun in class. I really liked the music in the video. I would not be able to draw as well as you guys can, as I am not a very good artist myself. I prefer to show my creativity through music. I hope you guys had a magnificent International Dot day! I loved seeing the video you created in celebration of International Dot Day. That is a day I had never heard of before. @Ross Mannell - I really enjoyed your comments pointing out how the maps on our blogs have dots that connect people, schools, and communities. Then, how you draw the similarity between those connections and the connections the children were making with their dot creations. Indeed, they connected their dots and managed to turn them into fabulous, creative works of art. You might not have to worry about the art getting washed away. It has been so hot here that it just might bake into the ground! @Mrs. Yollis - Thank you for videotaping our kids. What fun they are having! Jenna woke me up Saturday morning exclaiming, "Happy International Dot Day!" She was very excited. She will tell you how she celebrated. dot shirt and polka dot shorts. I told my mom all about the book The Dot. My mom enjoyed that the little girl learned that she really could draw. I had a really fantastic International Dot Day! Did you have a good time on International Dot Day? How did you celebrate International Dot Day? My family celebrated International Dot Day by reading A Million Dots by Andrew Clements. My favorite thing about the book is that the pictures look really pretty and they are all made of dots. Hi this is Hayden from 4KM,wow I think your blog is awesome. I think the dot looks interesting and I want to borrow that from the library myself and read it. hope you leave a comment and I might reply. I so enjoyed watching the video of you all participating in "International Dot Day" activities. This is the first time I heard about celebrating dots, and I must say that I think it is a thought-provoking event. Did you know that in the past Morse Code was used to communicate using a series of dots and dashes which replaced the written alphabet? In much the same way, if you look at Braille symbols you will see how raised dots are used effectively to replicate our alphabet so vision-impaired people can enjoy reading with their fingers instead of with their eyes! When one takes the time to think about it, dots play an important part in many aspects of our lives. Imagine how complicated reading would be if we didn't have that special dot called the period to end complete sentences! I don't even want to think about how jumbled our written thoughts would get without it! Your colorful and inventive "dot art" sent my imagination running wild. From your work, I envisioned far away galaxies along with their communities of solar systems, colorful ferris wheels, various geometric shapes, amazing mazes and all sorts of other dot inspired creations. I wished I was there doing some dot creations of my own! Thank you for sharing your dot activities with me through your blog. I am sure you all enjoyed doing these activities as much as I enjoyed seeing them done. We loved National Dot Day! We loved to show our awesome creations. It was fun to draw on our desks with the dry erase markers. Drawing on the sidewalk with chalk was also fun. My name is Maribel and I am from Mr.Millers room. I really liked the dots that you drew on your desks. I made a dot to but not on the desk but on a paper. There is not only Dot Day. There is also Punctuation Day. In school, we celebrated it by reading the book "Punctuation Takes a Vacation." Did you read any book for Punctuation Day (if you knew what it was) or Dot Day (if you knew what it was)? Outside our classroom, the whole class drew dots. My dot was a yellow, pink, green, purple, and blue dot. On the inside of the dot I put my initials. On the outside border, I did stripes going around the dot. The colors were yellow, pink, and green. What dot did you do?